Jewish Rye 2 Kilo Round Bread for sale. Buy online at Zingerman's Mail Order. Gourmet Gifts. Food Gifts. 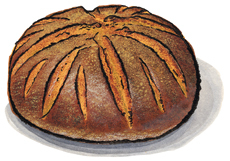 Zingerman’s most popular rye breads are now available in a 2 kilo (4.4 lb) round. This is the traditional way peasant breads were baked and bigger breads almost always taste better. They also last and last. Quarter them up and freeze, they’ll store for months.